Labor Day has come and gone. The hours of daylight are lessening, and the long, hot days of Summer are slowly becoming crisp, clear, cool days of Fall. I am happy to see Fall’s approach, and I am happy to wake to cool temperatures. The hint of cooler weather is making me crave socks. Yes, socks. I love socks. In fact, socks and turtle-necks are my favorite items of clothing. Socks are fashionable. Socks are fun. 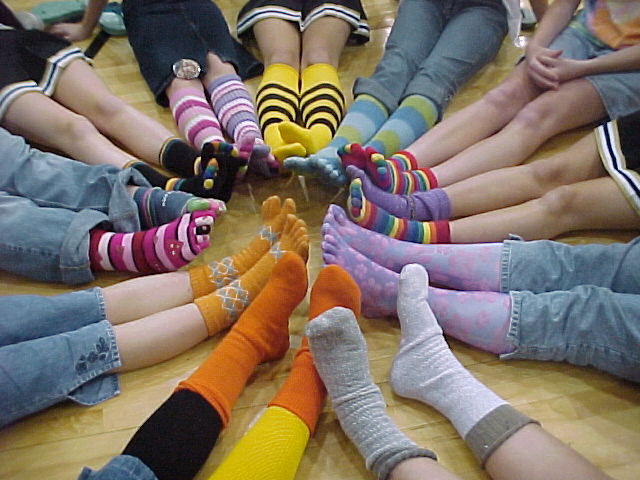 Socks come in so many types/styles like: fuzzy socks, silky socks, toe socks, toe-less socks, long socks, short socks, etc. Matching socks to your outfit would prove more entertaining and easier than shoes. Plus, miss-matching socks would be considered funny, whereas miss-matching your shoes is just an indication that you dressed yourself in the dark, not wanting to wake up your roommate, who snored all night, making it difficult for you to get any sleep, so you are half dead anyway. He really needs to ditch his girlfriend, she is only using him. Oh. Wait. Sorry. Got side-tracked. I’ve seen the signs: No Shirt. No Shoes. No Service. Oh how cozy and comfortable the feet of the world would be if “No Shoes” became “No Shoes – Only Socks”. Still, I am guessing if I were to head to work wearing no shoes just socks, I’d be asked to leave the office – maybe for good. But really, some shoes that people wear are no more appropriate for the office (or anywhere) than plain socks. In the workplace, bosses could sneak up on their employees, catching them downloading the latest App or updating their Facebook/Twitter page. Even better, employees could sneak up on their bosses, catching them taking the last of the coffee (without making another pot) or updating their Facebook/Twitter page. And, all employees would be able to walk away from his/her desk quietly, so that no one really knew when you left or how long you’ve been gone. The comfort and noise reduction are two great reasons wearing socks, no shoes – just socks, should be allowed in the workplace and every place else. Now, for the socks to be worn outdoors and in all kinds of weather, reinforcing the socks with a sole is necessary. I believe a minimal sole could be created – a ‘barely there’ kind of thing. Perhaps a much lighter version of the mukluk would work, a mix between mukluks and slipper socks. Hmmm . . . I wish it were socially acceptable to walk around in slippers… with socks, of course.